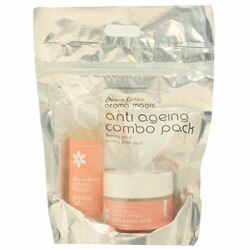 Buy Aroma Magic Anti Ageing Combo Pack - Firming Glow Pack + Firming Glow Gel - Refines, Tones & Tightens Skin. Aroma Magic Anti Ageing Combo Pack is a decent anti-ageing treatment that works very well on regainig of elasticity and smoothing of lines and wrinkles. Mix the contents of one sachet of Fimring Glow Pack with the required amount of Firming Gel to make a paste. Apply an even layer on the face and neck, and leave on for 15-20 minutes. Wipe or rinse off gently with water. For best results, use twice a week.